Our major primes students to work in the health/fitness industry as personal trainers, strength and conditioning coaches, aerobics instructors and wellness program directors. Students wishing to pursue careers in allied health fields may elect to complete additional courses in preparation for graduate education in exercise science or other pre-professional health-related disciplines such as physical therapy, physician assistance, occupational therapy and medicine. The Exercise Science Program is accredited by the Commission on Accreditation of Allied Health Education Programs (CAAHEP). Our program is recognized by the National Strength and Conditioning Association as having met the criteria for acceptance into their Education Recognition Program for Strength and Conditioning. Meet the Exercise Science Program faculty. The academic foundation of exercise science is in physiology, bioenergetics, and movement anatomy and mechanics, with applications to exercise responses and adaptations, strength and conditioning, sport performance, and disease and injury. Courses include human anatomy and physiology, fitness instruction, exercise physiology, fitness and stress testing, kinesiology, and injury prevention and emergency management. The program requires an internship experience, and includes many hands-on opportunities in health and fitness initiatives and scientific research. Learn more about Exercise Science major. Our program is designed to prepare students for professional certification through the American College of Sports Medicine or the National Strength and Conditioning Association. During the 2017-2018 academic year, our Exercise Science Program reported a 75% retention rate* and had a graduate placement rate of 84%**. * The 75% retention rate reported is based on the constantly varying numbers of Exercise Science students in our program. Students are not formally admitted to the Exercise Science Program. They may declare Exercise Science as a major once they are accepted to the university, and at any time during the semesters. ** Several of our graduates secured employment in areas outside of Exercise Science (e.g., law-enforcement, military, etc. ), which is often the career choices of these students from the time they begin in the Exercise Science program. EIM is a collaboration of different departments and individuals united in the EIM initiative which strives to promote that exercise IS medicine. Exercise Science Club – Contact Brent Fedorko for details. 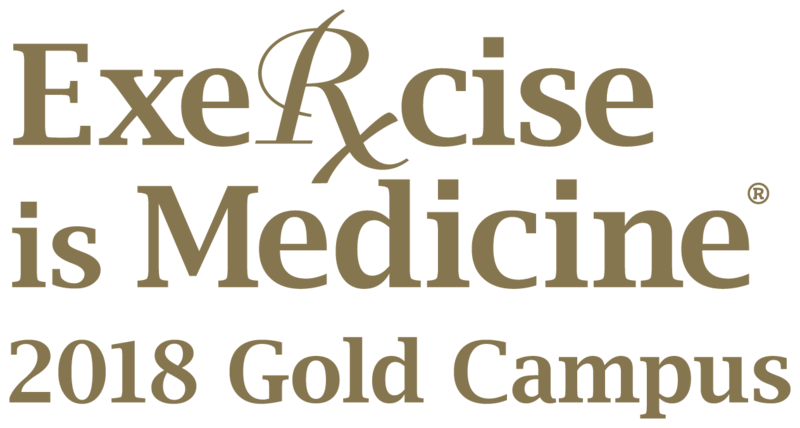 Exercise Is Medicine – Contact Lisa Marquette for details. Laboratory for Human Performance – Contact Scott Mazzetti for details. Exercise Science Journal Club – Contact Tim Werner for details. Barbell Club – Contact Seth Furman for details. Now Scheduling for Winter/Spring 2019 Internships. ***USG STUDENTS: Please contact Ms. Abby Gibson for Internship information. Please review this Internship Overview before inquiring further about internship information! Complete the Internship Application to generate a permission code to enroll (codes are only emailed during open enrollment dates). Enroll for EXSC 479 (3-10 credits) – The 370 section is ONLY for University of Shady Grove Students. Find an Internship Site from the List of Potential Sites (intended for ideas, you are not limited to these sites). Complete the Demographic Survey once you have confirmed an Internship site. Having your site complete the Site Agreement Form below will help you complete this information thoroughly. Follow the Due Dates and Requirements to complete all mandatory paperwork. Copy of current CPR card: from American Heart Association or Red Cross. American Heart Association CPR Courses are available online for a cost of $25. Permission Codes are generated by completing the APPLICATION SURVEY. Codes are sent ONCE a week during Open Enrollment in spring and fall semesters. For text updates and reminders, future interns can text @exscintern to 81010 to receive updated information and reminders regarding upcoming Internship Information and Meeting dates and times. Through our partnership with Global Experiences, an organization that specializes in internships abroad, you could gain invaluable work and international travel experience. Contact Mrs. Heather Mazzetti for further information. Support the School of Health Sciences Today!